(Fort Worth, TX) — Fort Worth, February 29, 2016 — Following a year of unseasonable weather, the Cowtown Marathon was back to its normal schedule to rave reviews and record finish times powered by the Cowtown Elite program. In total seven men and women ran faster than the previous course records; with new course records confirmed in the men’s and women’s Half Marathon distances and in the women’s 50K Ultra Marathon. In the men’s Half Marathon, a pack of six men remained together through eight miles until three Kenyans broke away: Nelson Oyugi, Nicholas Kurgat and Julius Koskei. In the final mile, Oyugi pushed the pace and ultimately won in the new course record of 1:04:34. Nicholas Kurgat held on for second place in 1:04:41. Julius Koskei finished third in 1:05:02. All three of the top men finished the course ahead of the previous course record on 1:06:02. In the women’s race, Veronicah Maina ran away from the field from the start, to win in 1:11:44, annihilating the previous course record by more than 3-1/2 minutes. Gladys Choboi finished second in 1:15:44 and Hellen Jemutai finished in third place in 1:16:23. In the marathon, Kimutai Cheruiyot ran alone from the start and passed the half marathon split in 1:07:15, well on his way toward a course record, but slowed in the second half to easily win in 2:18:34 but miss the course record by just over a minute. David Chepkwony took second place in 2:28:29. Adam Waldum, a student at TCU finished third in 2:33:10. In the women’s race, Loice Kangogo – like her teammate Kimutai Cheruiyot – ran hard alone from the start attempting and on pace for a course record, but slowed and fell short of the record but still maintained a win in 2:53:38. Brennan Liming of Cary NC, took second in 3:09:30; and Dallas runner Tayler Slack took third place in her debut marathon in 3:17:37. Bryan Morseman, in his debut 50K race, tried for the record, but also fell short by just over a minute while winning in 3:01:44. Scott Downard took second place at the 50K in 3:07:08; and past Marathon champion, Logan Sherman, finished third at the 50K in 3:09:07. The women’s 50K Ultra saw what could be considered the most impressive performance as Elizabeth Northern of Fort Worth TX, just two weeks after running a hard marathon at the USA Olympic Trials Marathon, ran hard to win the 50K race in 3:21:30 more than 30 minutes faster than the previous course record which had stood for 7 years. Northern’s split at the marathon point of the 50K, 2:45:38, was faster than her marathon time of two weeks earlier and faster than anyone of the women running the Marathon race. 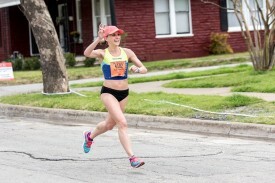 With the win, Northern has been a winner at all of the Cowtown race distances: 5K, 10K, Half Marathon, Marathon and 50K Ultra; including her win at the 5K in 17:23 the day before the Ultra Marathon. Two other women finished their 50K faster than the previous course records: Anna Hailey of Gardendale TX was second in 3:51:30 and Amanda Hicks of Washington DC was third in 3:53:40. The Cowtown is one of the largest multi-event races in the State of Texas and was voted favorite marathon by Competitor Magazine readers in January 2015. Established in 1979, The Cowtown races are presented by the University of North Texas Health Science Center, Chase, HCA North Texas, MillerCoors, Star-Telegram, NBC 5, Cook Children’s Healthcare System and Bruce Lowrie Chevrolet.